Almost a week after they were scheduled to be evicted forcibly from their home, the De Los Santos family is still living in the Riverside house they bought in 2002 — and then re-occupied last December — surrounded by a small group of sympathizers from groups like Occupy LA and Occupy Riverside. The family is requesting that government-owned corporation Freddie Mac renegotiate their mortgage, which they feel was foreclosed upon prematurely, and allow them to pay their debt. “I have the money to pay,” said De Los Santos to The Huffington Post. But according to Freddie Mac, there is no mortgage or loan to be modified. End of story? Not likely. Last December when Arturo and Magdalena De Los Santos and their four children reoccupied the foreclosed home, from which they had been evicted six months earlier, they say they did it to force Freddie Mac to come to a settlement that will enable them to return home legally. Arturo is a fourth-generation Mexican-American from Texas and a former Marine; Magdalena is an immigrant from Acapulco, Mexico. Arturo has worked for the same company for 21 years as a supervisor. “I make good money,” he said. Ten years after purchasing their dream house, this middle-class family finds itself in limbo, fighting to remain in the home where they raised their four children: Brandon, 12; Sasha, 10; Kevin, 8; and Millie, 7. Today, the De Los Santos family is part of a group of activists led by the Alliance of Californians for Community Empowerment (ACCE), an organization that confronts Freddie Mac and Fannie Mae over their roles in the foreclosure crisis. The De Los Santos family story was reported by The Huffington Post last Tuesday, when a five-day notice to vacate their home, issued by the Riverside Sheriff’s Department, expired. Since then, they and their supporters have been waiting for the expected forcible evacuation. They were not the only ones waiting — Freddie Mac is waiting as well. 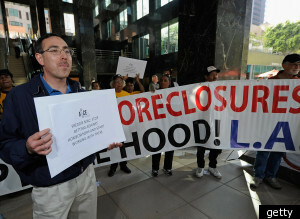 On Friday, Freddie Mac sought a court order asking the Riverside Sheriff to enforce the eviction order. “The company has apparently decided to have the family removed at all costs,” said Kuhns. De Los Santos insists on his offer to pay what he owes, to resume making mortgage payments and be allowed to remain legally in the home. “I make enough money,” he stated repeatedly. And this may have been his problem. Read the rest of Arturo’s story at Huffington Post.